A man who holds the unenviable record of being Spain's most unsuccessful driver, Adrian Campos is determined to improve his F1 reputation as he brings Campos, Spain's first ever F1 team to the grid. Campos' entry into motor sports was rather unconventional, and his first triumph came when he was crowned Spanish radio-controlled racing champion in 1980. When he decided to move into driving the following year he was accompanied by an armed bodyguard to his races after his grandfather, the industrialist Luis Suner, was kidnapped and held hostage by Basque separatist group ETA. He had modest success in F3 and F3000 before signing for Minardi F1 in 1987. His debut season was one to forget, completing just one race all season, although coincidentally this race was in front of his home crowd at the Spanish Grand Prix, where he finished 14th. 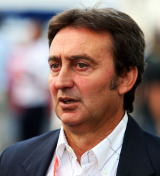 The following season was even worse, and after failing to qualify for three consecutive races he was dropped by Minardi after only five races in favour of Pierluigi Martini. After a disappointing F1 career he spent a few years away from the sport before setting up Campos Racing in 1998. Success followed soon after with Marc Gene winning the Opel Fortuna Nissan series and Campos has subsequently seen silverware with his teams in GP2 and F3. Perhaps Campos' most notable achievement, however, was spotting the potential in a young Spanish driver called Fernando Alonso in 1996. After success in the junior series, Campos achieved his long-term dream of gaining a place on the F1 grid for the 2010 season. His team may be the new kids on the block, but he has expectations for a top-ten finish in their debut season. After his protégé Alonso became Spain's first ever world champion, can Campos steer Spain's first ever F1 team to success?